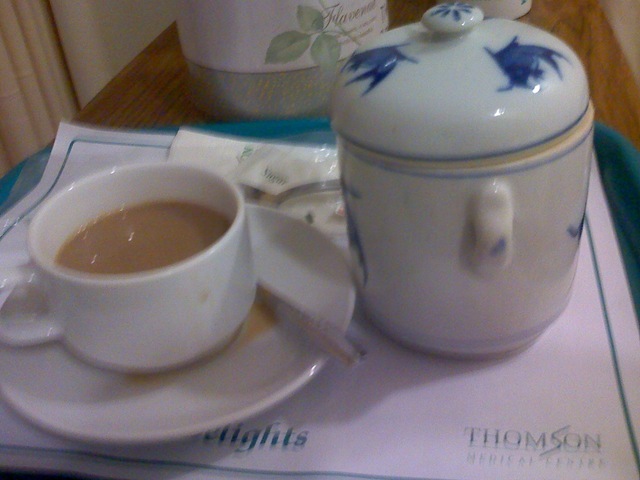 I was admitted into Thomson Medical Centre on Wed! It was one ordeal I never asked for. Updated in my previous entries – I had been experiencing bleeding for 1+ week. After 3 visits to the gyn and 2 injections; there still aren’t much improvements to my conditions. Tues night became the last straw for me. Cramps and backache and fountain of blood – enough to scare me to ring for help. Gyn already said if there is a next “relapse” – I won’t have a choice but to admit myself into the hospital. I woke up knowing the choice is no longer mine. Called gyn and told her the situation; packed my bags and went straight to the hospital with mum and hubby in tow. The weird thing is that I don’t belong to any of the “risk categories” nor did I had a major impact on my womb. Gyn is also concerned that this condition shouldn’t happened so early in a pregnancy if any at all. Why did it happened to me then?? I asked that question umpteen times too. I didn’t quite have an answer to that. But at least now we know the cause of bleeding and cramps. 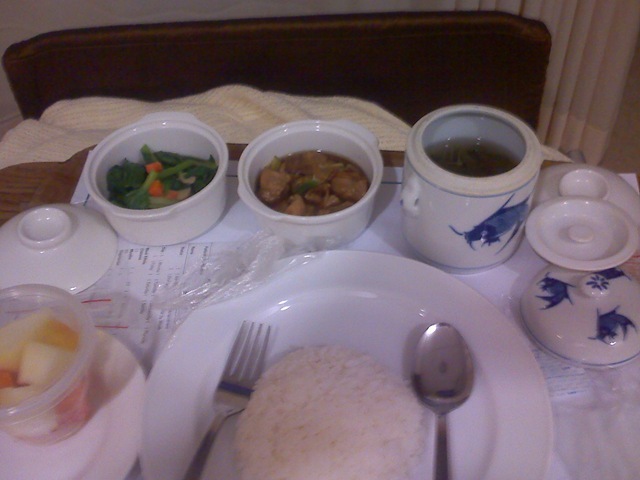 I was immediately put on dosages of blood-clotting medicine and womb-calming injection. 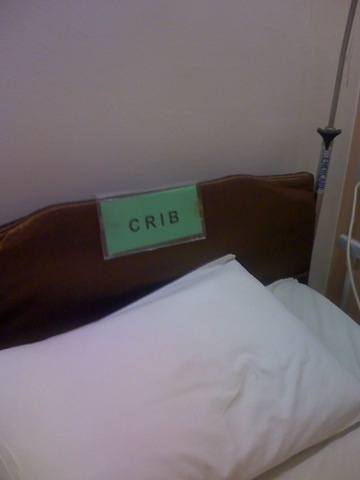 I was classified a C.R.I.B – Compulsory Rest In Bed – as well. To me – it was a rather interesting hospital stay. Let’s not talk about all the discomfort and etc. I must say that TMC really impressed me in terms of their staff, facilities and most importantly – FOOD! We asked for a 4 bedded room (I didn’t want to spend too much); but we got a free upgrade to a 2 bedded room instead! The nurses were really “Thomson angels” – as the name nicely suggested. Most of them attending to me are older, auntie-looking nurses. But they really do their job well! Throughout my stay, b’cos I am a CRIB – they kept saying (nicely) – “don’t move; just press the attention bell if you need anything”. They reminded me time and time again not to move an inch. Must say that they make an otherwise unpleasant incident much easier. Ok – now to my fav section – FOOD! Thank God, I still have an appetite. 🙂 Probably the only thing I look forward to are meal times. They served us 6 meals daily! haa.. no wonder gyn told me that from the scan, bb is quite chubby! His stomach and weight is slightly above average at this stage! 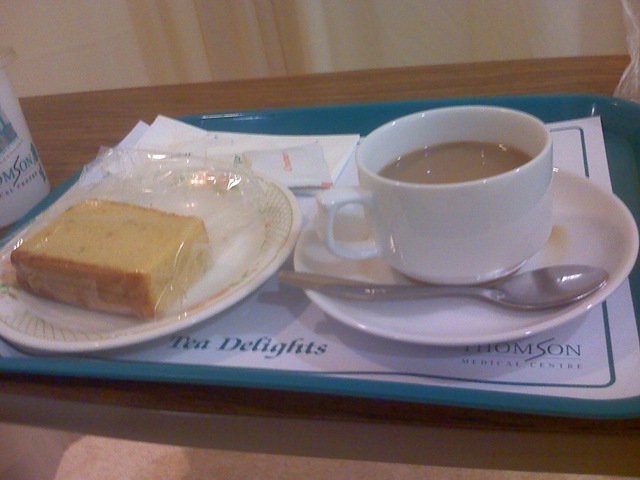 I thought – never mind – I am too troubled to be concerned about dieting in the hospital. Anyway, hospital food is supposed to be healthy right? hee.. that gave me the excuse to eat, eat and eat….. So.. I was really well-fed! 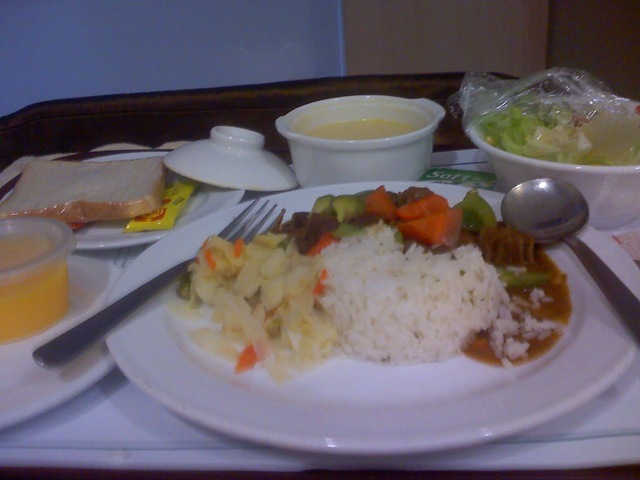 haha.. Never imagined hospital food to be quite yummy! I had mee siam for breakfast the other day too! Thought these hawker-like food aren’t supposed to be healthy?? 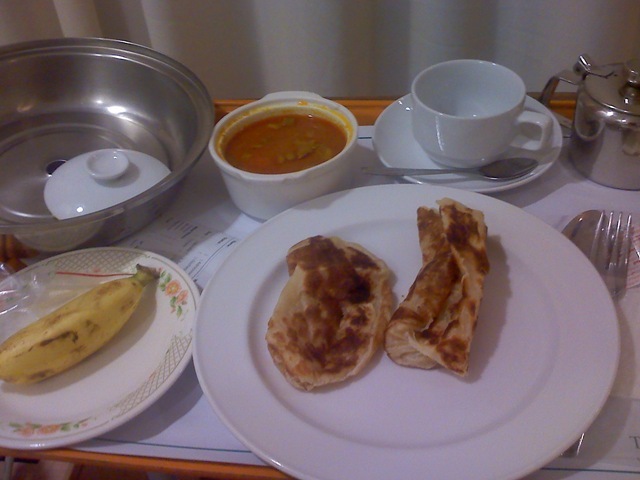 But then, since they are “hospital-food” – should be fine right? So the above are my “comfort food” throughout my 3 days, 2 nights stay at TMC. Just started my first week at work after a long 1+ month of sabbatical leave. It is amazing how I managed to get through it! (Indeed God’s strength is more than sufficient!). Considering that I was already used to afternoon naps, no-restriction internet access (my office blocks almost everything! ), chinese drama serials, msn chats with friends, logging onto facebook 5X a day to check out for updates and many many many more luxuries enjoyed during my “off” days!!!! But then, I psych myself last Sun to prepare for Mon. It started slow and easy for a while before the usual stress of targets and expectations “mountained” in ( tiring topic, let’s leave it for other posts). There were days that I really “looked pregnant” as most of my colleagues will comment (depending on my dressing for that day). And I was really a little frustrated/amused that people still can’t get the “hint” to offer their seats in a crowded train. Those days that I looked “less pregnant” , I will normally forgave those who ignored me whether intentionally or not. Wanted to write something about week 15 before it flies pass! Not sure if my tummy is growing b’cos BB is growing or I am just having my appetite back. Eating habits resume to pre-1st trimester now; thus gaining weight and I think fats? Anyhow, here is a pic of my tummy about 15+ weeks. Most tell me I look preggy now! I told them – I think this is 50% fats and 50% BB. haa..